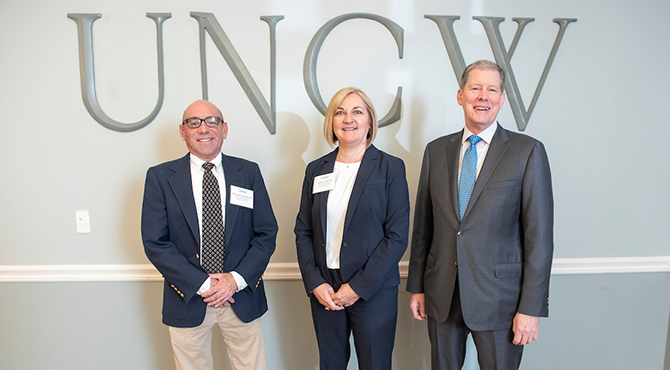 A financial guru, a real estate expert and a leading executive for Southern Bank and Trust were presented with the 2019 Cameron School of Business Outstanding Alumni Awards during the 37th annual Business Week, sponsored by the UNCW Cameron School of Business. The recipients joined alumni, faculty, staff and students for a recognition breakfast on March 27. This year’s recipients are Howell Graham ’85; Judy Lynn ’89; and David Wallace ’77. Described as a “shining example of what a UNCW graduate should be,” by retired faculty member Denis Carter, Howell Graham is a full partner in the Joseph Robb Real Estate Appraisal Firm. He served as treasurer of the Wilmington Mortgage Bankers Association and was voted 2003 Mortgage Bankers Affiliate of the Year. Graham commends UNCW for having small class sizes and offering plenty of individual attention. “I wouldn’t trade it for anything,” he said of his undergraduate experience. He was the first cystic fibrosis patient to receive a double-lung transplant in the Southeast and is believed to be the longest surviving patient of double-lung surgery in the world. He will mark the 29th anniversary of his transplant in October 2019. An advocate for organ donation, he is committed to educating the community about the critical need for donors. He has consulted with UNCW professor Daniel Baden on his MARBIONC research exploring the benefits of red tide on the treatment of cystic fibrosis. He currently serves as a member of the Carolina Organ Procurement Association. Raleigh native Judy Lynn credits the UNCW Career Center for aiding her professional development and exposing her to companies that were interested in hiring UNCW graduates. She also credits UNCW for giving her “variety” when it came to her courses and her mother for embodying “balance” when it came to being a mom and having a career. She began her career in financial services 30 years ago by entering into the commercial Bank Management Program, which is now Bank of America. She also graduated from the N.C. School of Banking, as well as the Graduate School of Banking at Louisiana State University. She is now the executive vice president and chief credit officer for Southern Bank and Trust Company, a $2.6 billion community bank. Since graduating with a bachelor’s degree in economics, David Wallace has seen the “booms and the busts” of the technology industry firsthand. He currently works as the global financial services marketing manager for leading software analytics company SAS. UNCW only had 3,300 students when he left to earn his MBA from East Carolina University, which he did in 16 months. “UNCW taught me to think critically and logically, preparing me quite well for the MBA program,” he said. Wallace is an active alumnus and member of both the Clocktower Society and the UNCW Society. He and his brother, Stephen C. Wallace ’80, established the Slim and Edith Wallace Scholarship in Business in honor of their parents who both held a deep belief in the importance and value of higher education.